Schwedgon Pagoda in Yangon, Myanmar. 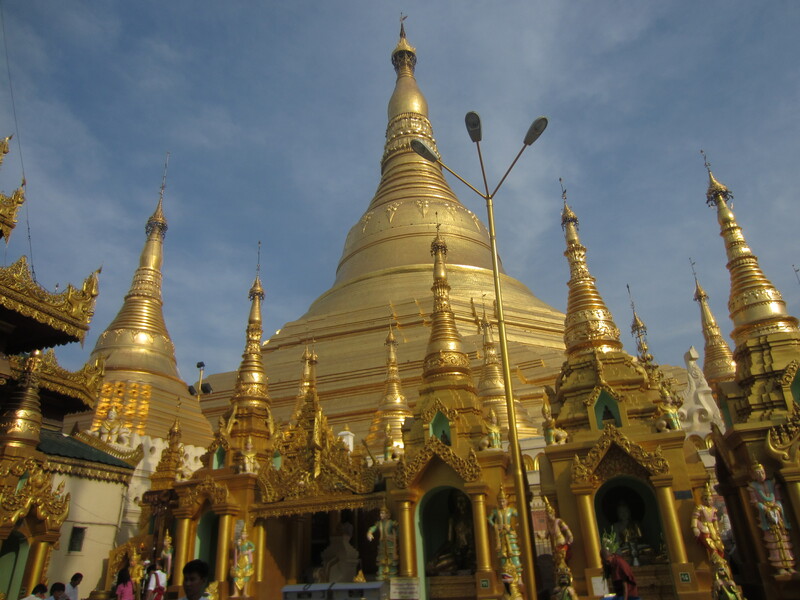 The most sacred pagoda in Myanmar and a national symbol. I went to Myanmar with low expectations. Though I’ll admit my knowledge of the political situation was relatively limited, something about the words “Myanmar” or “Burma” sent chills down my spine with ideas of violence, oppression and scary men in military uniform. As I began to research further for the trip, my fears both soared and subdued, depending on the day and who I was speaking with. On the one hand, stories from other travelers painted a picture of a beautiful country full of beautiful people where mass tourism had yet to leave its mark, where foreigners, especially, had nothing to fear from a country trying to make good with the West. On the other side, this is a country whose infrastructure and relations with the West are so poor that it doesn’t even have ATMs, a country where travel is restricted to limited government-approved destinations and where locals are forbidden to communicate too closely with outsiders. This is a country where, for the first time I’d come across, Lonely Planet openly encouraged travelers to avoid government-run shops and hotels in order to reduce the amount of money going into the hands of an unlawful, oppressive regime. But the minute I landed in Yangon my fears instantly subsided. After months battling aggressive Indians, Thais, Cambodians and other Asians jaded from the commercialization and indulgence of mass tourism, I was amazed to find that the people of Myanmar are some of the kindest people I’ve ever met. Everywhere we went, the Myanmar people went out of their way to greet us, help us or simply to smile at us and, unlike nearly every other Asian country I’ve been to, were willing to bargain fairly without taking advantage of us. The generosity of the Myanmar people was also incredible. Whether it was having lunch at the home of a family in Yangon that Waldo met on the train, or receiving homemade cigars and flower leis from the old lady on the boat or trying the incredibly popular yet disgusting betel nut with the men at the ticket agency (see video below), the hospitality of the people of Myanmar was extraordinary. My personal experience with a certain monk and boatman who went vastly out of their way to help me after my extremely bad judgment was a particular kindness I will never forget. As a travel destination, Myanmar is honestly not unlike every other neighboring Buddhist country in Southeast Asia – except with extremely poor infrastructure. Not gonna lie, unless you are extremely patient or really enjoy long, bumpy bus rides, poor Internet connections or frequent power outages, I would not recommend traveling Laos and Myanmar back to back – at least not for seven weeks straight. But once you are there, Myanmar can provide some truly beautiful experiences into an old world whose existence has remained largely untouched by modernity. The following are a handful of my most memorable experiences in Myanmar.